When a band of Metal has more than 6 members, you know you can always wait something new, innovating and rare. 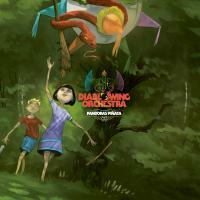 This time is not the exception, because DIABLO SWING ORCHESTRA has come with another “masterpiece”, in the whole sense of the word. For fans who always are yearning for something better, something you’ve never heard before, “Pandora’s Piñata”is the album for you, because it has so many elements that makes a complex and worked structure, in something easy to listen to, fast to remember, and damn sure something that you’ll have in mind for a while. The musical structure for me is hard to explain, because I’m just another regular person, not a musical genius, but I’ll give a try: a mix of many genres, passing from the fastest Metal, to Jazz and lunge sections, giving moments of even Ska and many other rhythms that are not too much familiar for me, but they sound good as hell. I won’t individualize the instruments because it’s useless, everyone here has a lot of talent, and they intend to make music that sound amazing together, which it’s exactly what happens, as a listener you could hear every instrument, but you can’t give a higher rank to one or another, they sound as good as hell in one structure. For the legend that they intend to keep alive (go and read it, it’s truly interesting), they are fulfilling the vows made for his forefathers, honoring them and making the name of DIABLO SWING ORCHESTRA one that’s worth to mention for the times to come.